Such fun card, Joyce! I love the angled sentiment, it gives a lot of movement to this card, and the florals look so bright and happy! Beautiful, bold blooms, Joyce! Your card would make anyone feel better fast! Love those gorgeous flowers...so beautiful Joyce! This pretty card with those wonderful colors would make anyone feel better!! Fabulous Joyce! Love the angled sentiment panel and the flowers are beautiful, Joyce!!!! Gorgeous card...love those bold and vibrant colors you used for your flowers, a wonderful take on the inspiration photo. Beautiful blooms, and I love how you created a window for your sentiment! This card will definitely help someone feel better! Well done as always, Joyce! Joyce those flowers are so pretty and love that peak a boo window! 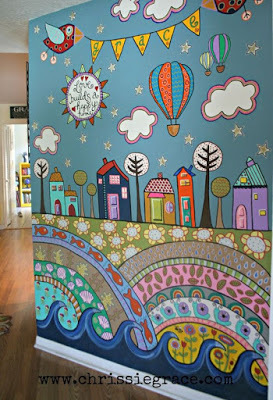 Your color choices tie in with the mural beautifully, Joyce, and those blooms are so much fun.